If you've checked out my blog you'll see that I have another post featuring my cute little Snowmen Ornaments. These little guys are distant relatives of theirs that just arrived in town. They're made in the same way as the others but these little guys have embellished brass key bodies that I salvaged from a key shop in town that was going out of business. The creative possibilities with these little guys are endless! You will receive one similar to the ones pictured below but uniquely made from my endless supply of repurposed keys and components. Please email me at: newagaindesign@att.net if you're interested in having me create one of these little guys just for you! These are so cute..little jewels..love all the sparkle. Merry Christmas I just joined the party! Oh, I love your key snowmen! 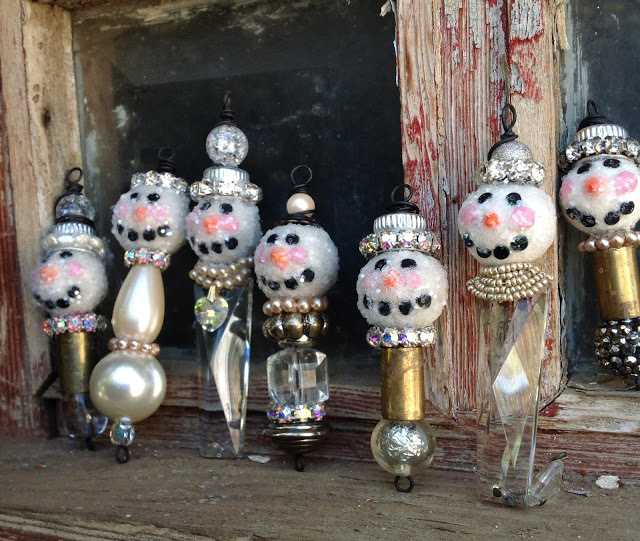 Oh, I love your key snowmen! Thank you for taking my Merry Men of Winter online class! Thank you! Deidre...I love these little guys! Thank you! Deryn..your talent inspires me. These are SO darn cute! Thanks for sharing them with us at VIParty. Thank you! Betsy, I love making them! These are adorable! What a great way to repurpose. Thank you! Erica...thanks for stopping by! These are adorable! Love the addition of the key! Thank you! There's and endless number of things you can do with these cute little guys. How absolutely adorable and what a great spin to put on Deryn's class! They are absolutely adorable!! I love your use of keys for the snowmen bodies! They are so cute! Thank you! Kathleen, they are so much fun to make! Thank you! Jan, I have so many keys and I'm glad I found a use for them! These keys are likely for the snow man shape on the top of the keys with shipping chargers also for the customers. From this we can without the boom essays to get free shipping under the repurposed of the salvaged.